It’s frankly amazing how long this show has been on the air, and just how big it’s become. The scientific factor I use to determine its popularity is number of green men, the green lyrca full body suit mascot that Charlie wears during a couple of episodes. I see at Philadelphia and national sporting events, and on Halloween. The actual suit only appeared in three episodes of the series, and yet it spawned a phenomenon as green men are everywhere. The show has the potential to get tiresome. In each episode, the “gang” – as the characters are known find a topic, be it racism, terrorism, abortion, or sometimes less political and more random, and go off, offending tons of people in the process and coming out making fools of themselves. Yet it stays relatively fresh, and the writers have done a pretty good job of thinking of material that is new enough to keep me laughing. I really tried to hold off this comparison for as long as could, even though I wanted to use it all article, but Curb Your Enthusiasm really is by far the most similar show on TV to It’s Always Sunny in Philadelphia. They’re both basically shows that apply a similar process to a new set of facts every episode. You can enter a situation into the It’s Always Sunny machine, and it’s pretty easy to figure out how things are going to go, but it still generally ends up being pretty funny. Like in Curb, it’s all about the main characters, and everyone else is the world is just someone for them to play off of. While in Curb about equal times the other characters are crazy or normal, in It’s Always Sunny, they’re generally normal conservative folks who are utterly outraged by the gang’s lewd, selfish and inappropriate behavior. Highlights of the last season include Dennis implying that Mac and he will bring some women onto a boat, and since they can’t get off, there will be an “implication,” which is disturbing even for Mac. 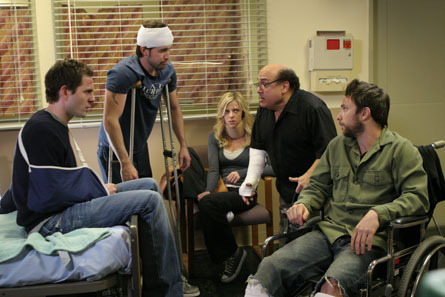 Another highlight is the gang’s drunken memories in flashback form of a Halloween party in which Dee may have gotten pregnant, and in which Dee is remembered as more and more birdlike, eventually ending up as an ostrich. Looking over the episode list, there aren’t quite as many stone cold classics as there have been in previous seasons, though to be fair, my opinions could change, for good or ill, with a second viewing. Why It’s This High: No show generates more out loud laughs than It’s Always Sunny, even after six years; Charlie makes me laugh. Best Episode of the Most Recent Season: “Mac’s Big Break” – My friends and I became somewhat obsessed with this strange part of the episode in which Dennis uses a strange voice on his radio show asking about the US’s involvement in two wars – I can’t find anything on youtube, so you’ll just have to watch the full episode. You certainly understand how to bring an iissue to light and mak it important.